The snow is piling up on sidewalks, forcing people to walk in streets, and the streets are so narrow, cars can barely fit. 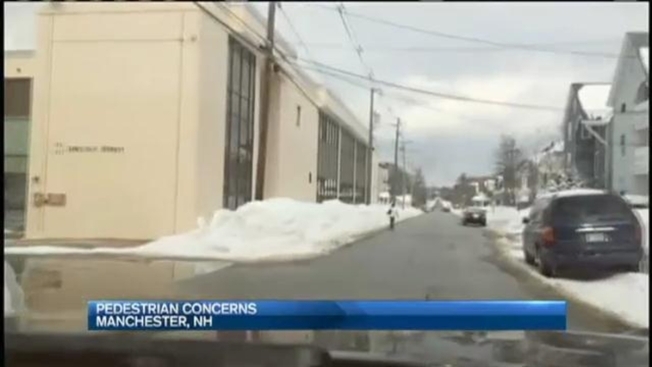 It's an issue in cities and towns across New England, and necn found out how residents in Manchester, New Hampshire, are dealing with it. "It can happen in a split second, a bad accident," said Manchester Police Lt. Brian O'Keefe. And it did. It was on Wilson Street last Friday evening. Police say a 6-year-old popped out from behind a snowbank and was hit by an oncoming car. "A young 6-year-old girl struck by a 5,000-pound motor vehicle," said O'Keefe. "Thankfully, someone was watching out for her and she wasn't seriously injured." The little girl was taken to the hospital, but only suffered minor cuts and bruises. Necn talked to Gary Prentice, who was driving on Wilson Street, and he said it's sad to hear what happened, but he admits it was inevitable. "That's my biggest thing, is the kids getting run over or getting hit when they're coming out of school," Prentice said. "With these snowbanks you can't see around the corners." It's risky getting around the city right now. Necn's Katherine Underwood used her cell phone to video a drive up Wilson. Photographer Nick Saragosa carefully passes a woman walking in the road and then pulls over to let a truck pass because there's simply not enough room for two vehicles. Manchester residents Vicky Young and Gracially Feliciano were trying their best to stay on the sidewalk, but they say it's not always an option. "It's really hard because you don't want to get in the way of the traffic," Young said. "But there is no where people can put the snow so the sidewalks are blocked and forcing everyone to walk in the streets." On Lowell street, necn captured more video of a really close call, a truck driving within centimeters of parked vehicles. That was after the news vehicle got clipped two times by drivers passing by. Bill Cooper was crossing Elm Street with one hand full groceries, the other on his cane. "It's terrible, terrible," Cooper said. "We all have to walk in the road. We shouldn't have to, someone is going to get hurt, someone is going to get really hurt." Lt. O'Keefe says the city is doing the best it can but right now, Mother Nature is winning the fight. "It's tough, everyone is over budget, we are running out of sand and salt everywhere, but they have done a remarkable job," Lt. O'Keefe said. Necn spoke with the little girl's grandmother, who says the driver who hit her granddaughter was going too fast. Police, however, did not charge the driver with any motor vehicle infraction.